Located on the southernmost tip of the Zamboanga Peninsula, Zamboanga City is one of the major gateways to Mindanao. And there is indeed no better way to start your Mindanao adventure than from here. Its city center is filled with history and culture, the food scene is very vibrant, and there are beaches which you can easily access. Dubbed as Asia’s Latin City, Zamboanga City’s identity is deeply intertwined with Spain—from the way they speak, to the food they eat. Their culture is a colorful mix between the conquistadores of yore, to Christian and Muslim customs. 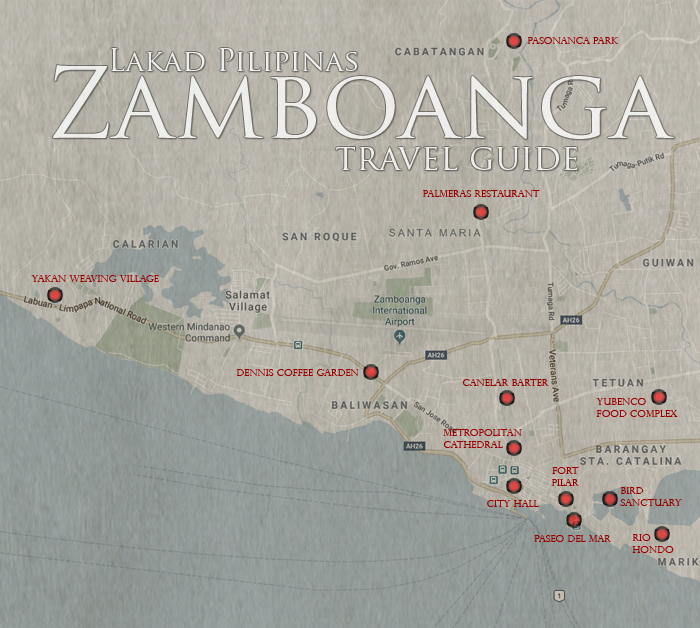 This Zamboanga travel guide aims to help both first time and returning visitors on how to get there, where to eat, where to stay, and what to see and do in and around the city on a modest budget. Zamboanga, the center of the Zamboanga Peninsula Region, is the sixth largest city in the Philippines in terms of population and third largest by land area. It’s populated by a majority of Christians, followed closely by Muslims. It is also inhabited by the Samal, Yakan, Tausug, and Badjao people. Located on the region’s southernmost tip, it’s about an hour and a half away by plane from Manila. Zamboanga was originally founded by the Subanon people during the 12th to 13th century. Spain came in at 1521, establishing a fort, their stronghold on the islands of Mindanao. The Spanish rule, which only ended during the 1890’s, had a strong influence on the city, not only in religion, but in their language, food, and traditions. A republic was established after the Spaniards left, the Republic of Zamboanga, up until the Commonwealth Period where it was turned into a city. Zamboanga has only two seasons, rainy and dry. The best time to go would be during the dry months of November to April, but if you want to enjoy the best of what the city has to offer, you should try and go during October where the annual Zamboanga Hermosa Festival happens. How Much? – Cuanto este? ● The best time to go to Zamboanga City is during October when they celebrate the annual Zamboanga Hermosa Festival. It’s the perfect time to see an actual vinta race, watch a mascota gown competition, see the faithful pray novenas at Fort Pilar, and witness the street dancing along Calle Valderosa. 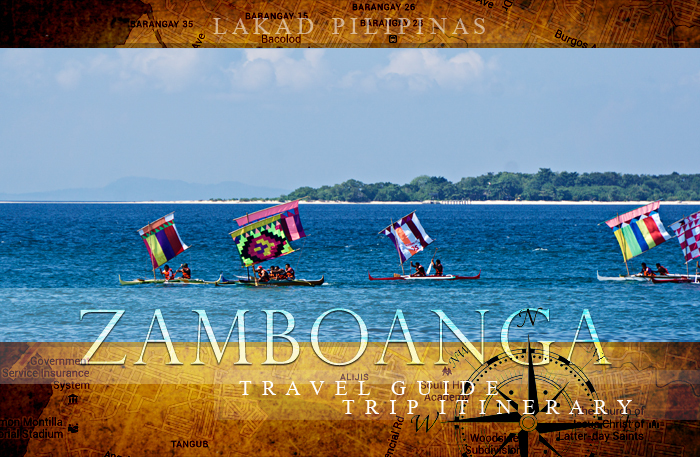 ● For beach lovers, there are islands you can visit in Zamboanga. If you’re into snorkeling, it’s best to bring your own gear (snorkel, mask, underwater camera), as most tours don’t really provide one for guests. It is also advisable to bring a dry bag with you. ● There are a lot of banks and ATM machines at the city center, so you can actually bring just the right amount of money, and simply withdraw if needed. ● Dressing conservatively isn’t really a must when in Zamboanga, the city is as modern as any in the Philippines. ● Zamboanga City is a pretty safe city, don’t let the military presence in the area intimidate you. Two of the three major airlines in the Philippines, Philippine Airlines and Cebu Pacific, has direct flights from Manila to Zamboanga City. Travel time is about an hour and forty five minutes, with five daily flights. Zamboanga can also be reached by ferries, albeit on a longer travel time, from major cities like Manila, Cebu, and Davao. If you’re already in Visayas and Mindanao, you can even ride a bus, both air-conditioned and non-aircon, going to Zamboanga through Ceres and Rural Transit. Note, however, that if you’re coming from Visayas, it also entails a ferry ride, which is packaged within your bus trip. The main modes of transportation in Zamboanga is the jeepney and the tricycle. The former comes in two varieties, the regular flamboyant and colorful jeepneys you see all over the Philippines, and an unadorned boxy Ford Fierra-type that used to be popular during the eighties. Minimum fare is set at PHP8.00. To stop, you say “Urilya lang.” Tricycles, which they pronounce as tricy-col, in the city have a minimum fare of PHP20.00 per person and can usually seat four people at a time. There are tour operators who can actually make your life easier when traveling around Zamboanga City. It is possible to do most activities DIY, but if you want to maximize your time and see all the sights in a more efficient manner, consider booking a tour. During our week-long stay in Zamboanga, we utilized such a service. There are lodging options for every kind of travelers in Zamboanga, from expensive five star hotels and sprawling resorts, to budget hotels and cheap hostels. Most of these are located right at the city center, although it’s also okay to stay around the fringes of the city since Zamboanga isn’t really that big. A note of warning for people going to Zamboanga, this city will make you add some weight. There are numerous food choices in the city—you can take your pick from Spanish cuisine and seafood feasts (don’t forget to have curacha), to Moro and Malaysian dishes. For the not-so-adventurous, traditional Filipino and Western fares can also be found within the city along with popular fastfood joints like Jollibee and McDonald’s. And like most cities in Mindanao, a large percentage of the city’s population is Muslim, so expect to find halal restaurants. Zamboanga City, being one of the oldest cities in the Philippines, is highly cultural. You can find heritage structures along its avenues, the most notable of which is the massive Fort Pilar where the Spaniards once held their seat in Mindanao. Within the city, you can also find local Mindanaoan culture like at the Yakan Weaving Village. Natural attractions also abound, from the celebrated pink beach of Sta. Cruz Island, the pristine beaches of Once Islas, and the majestic Merloquet Falls. Touring Zamboanga can be divided into three areas—the city center (where you can simply walk from one location to the next), the Pasonanca Park area, and the farther places which you’d need to access via public transports or in some cases, via organized tours. There’s only one major festival in Zamboanga and that’s the Zamboanga Hermosa Festival. It is dedicated to the miraculous image of the Nuestra Señora del Pilar enshrined at Fort Pilar. Celebrated during the whole month of October, its highlights include the Regatta de Zamboanga, ZamPEX, Asao Lechon Festival, Mascota de Zamboanga, and the Zamboanga Hermosa Street Dance Competition. A three day itinerary is mostly enough for touring Zamboanga City. It’s perfect for long weekends—you’ll just have to fly really early and leave at the last possible flight back. A day tour is also possible, but would be very limiting, you can mostly see either just the city center or a brief tour of Sta. Cruz Island. For a more extensive tour, I would suggest a four-day Zamboanga itinerary, this way you really can enjoy everything the city has to offer, all the good dishes included. For the sake of this itinerary, I listed a rough sketch of how you would be traveling from one place to the next via jeepneys or tricycles. It is very much cheaper to go by jeepney—just ask around if you’re not familiar with the route, Zamboangeños are very helpful—since most tricycle driver would usually ask that you pay for the full fare of the entire tricycle.